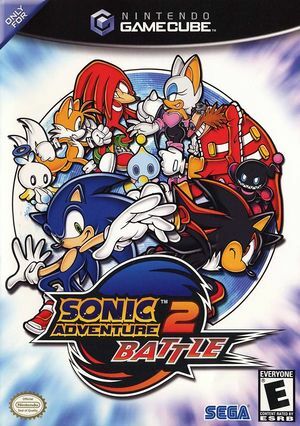 Sonic and company are back and better than ever in Sonic Adventure 2: Battle. Dr. Eggman is causing trouble once again, and it's up to Sonic, Tails, and Knuckles to stop him. Experience faster action, all-new two-player games, and a branching storyline that lets you choose to save the world as the Hero side, or conquer it as the Dark side. In the single-player mode, you'll go through more than 30 unique stages, which include a forgotten pyramid, an abandoned military base, and a giant space station. And then there's the expanded two-player mode, which features 12 playable characters competing in new head-to-head games. Connections to a GBA (emulated via VBA-M) to enable play of "Tiny Chao Garden" does work as of the VBA-Link updates. In order to get a connection, sometimes the GBA Link has to be turned off as it's attempting to connect. There may be slow framerates as well. Getting the chao back in can be problematic, but has worked at least once. 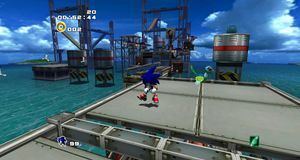 Since 5.0-5745, textures in Sonic Adventure 2: Battle will appear blurry in the distance at internal resolutions above native, due to false positives in Arbitrary Mipmap Detection. Since 5.0-8296, this setting can be disabled to work around the issue. However, if any "mip trick" effects are used by the game, they will not work correctly. Random letters and numbers missing, most noticeably in Chao World but occasionally in subtitles. The cause is unknown, and occurs even with a real GC BIOS. Setting the Texture Cache Accuracy to safe seems to be the fix. This is caused by the game running in 50Hz mode. Hold down B as emulation starts to get a prompt for 60Hz mode, or use RealXFB to fix 50 Hz mode. Fixed prior to 5.0-8482, likely with Hybrid XFB. When using Dual Core mode Sonic Adventure 2: Battle can be sensitive to emulation lag, which can result in various side effects including instability and crashes with certain stages (most cart racing stages are affected). Disabling "Enable Dual Core" will greatly increase stability. Refer issue 7143, issue 10776. Single Core is now used by default for this title as of 5.0-6188. This Gecko code will correct UI stretching seen with the Widescreen Hack. The graph below charts the compatibility with Sonic Adventure 2: Battle since Dolphin's 2.0 release, listing revisions only where a compatibility change occurred. r5774 Windows 7 Intel Core i7-930 @ 2.8GHz NVIDIA GeForce GTX 470 Perfect, 60FPS @ 1080p Widescreen. This page was last edited on 22 July 2018, at 06:08.